The Viaje Farmer Bill Hatchet is a new addition to Viaje’s seasonal release for the Thanksgiving season. It was back at the 2014 IPCPR Trade Show where we got word that Farmer Bill Hatchet was coming. In 2011, Viaje launched their Thanksgiving series with the gordo-sized Viaje White Label Project Stuffed Turkey. For 2012, the Stuffed Turkey was rebranded the White Label Project Stuffed Turkey White Meat and a maduro counterpart called the White Label Project Stuffed Turkey Dark Meat was created. For 2014, the Stuffed Turkey cigars were moved out of the experimental White Label Project into its own line – complete with its own packaging. Viaje introduced a slogan that helped incorporate the new Farmer Bill Hatchet cigar into the seasonal release. “How does Stuffed Turkey get to your table for Thanksgiving? Call in the hatchet man.” Recently I had an opportunity to smoke the Viaje Farmer Bill Hatchet in a size being called “Handle”. Overall, I found this to be an excellent cigar and a nice addition into the Viaje lineup. Like most Viaje lines, the Viaje Farmer Bill Hatchet Handle is a small batch release. This was a smaller batch than normal. While Viaje has not made the production numbers known, most retailers reported only getting a box or two. This is the inaugural release of Farmer Bill Hatchet. While there is no word if this will be an on-going line, Viaje company President Andre Farkas has typically said he whether lines like this come back depend on consumer response. If the line does return, it will also most likely contain a different vintage of tobacco. Without further ado, let’s take a closer look at the Viaje Farmer Bill Hatchet Handle and see what this cigar brings to the table. 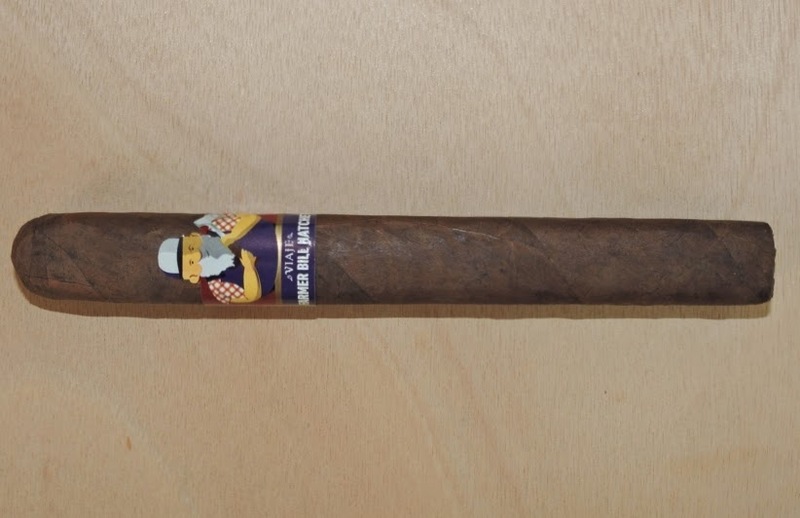 The Viaje Farmer Bill Hatchet is an all-Nicaraguan blend featuring a Nicaraguan Criollo wrapper. The Viaje Farmer Bill Hatchet has been introduced in one size known as the “Handle”. It is a box-pressed Churchill measuring 7 x 52. The cigars are packaged ten per box. The Viaje Farmer Bill Hatchet Handle has a firm box-press. The Nicaraguan Criollo wrapper has a coffee bean brown with a strong colorado red tint to it. Upon closer examination, there is some darker marbling to it. There is also a light coating of oil on the wrapper. The wrapper has some visible veins and some thin visible wrapper seams. 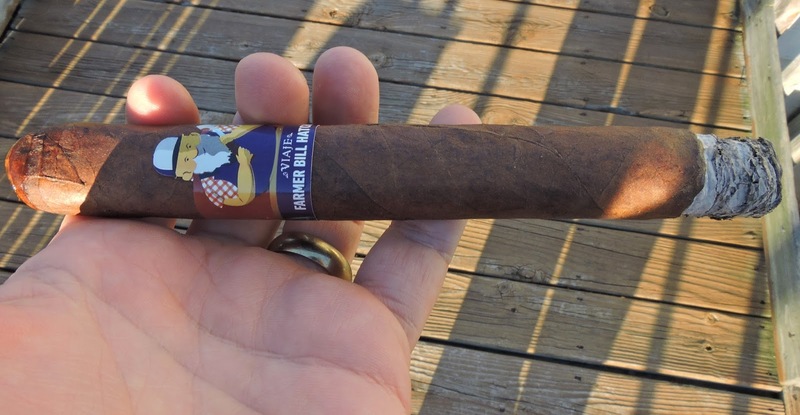 The band has a similar design to the new bands for the Viaje Stuffed Turkey 2014, but with a different color scheme – and of course the “Farmer Bill Hatchet” character instead of a turkey character. The upper portion (approximately 2/3) of the band has a dark red background and the lower portion of the band has a purple background. A gold stripe separates the two backgrounds. The “Farmer Bill” character sits on the upper portion. He has a long white and gray beard. He is also dressed in a red and white plaid shirt with purple overalls. The character is also wearing a white and purple baseball cap and has a silver ax in his left hand. To the left and right of “Farmer Bill” are gold trimmed forks and knives. The lower (purple) portion of the band has the text “VIAJE” logo text in white font. Below that text is the text “FARMER BILL HATCHET” in larger white font. To the left and right of the text are gold trimmed cooked turkeys. Prior to lighting up the Viaje Farmer Bill Hatchet Handle, I went with a straight cut to remove the cap. Once the cap was clipped, I moved on to the pre-light draw. The dry draw provided several subtle flavors including cinnamon spice, earth, cream, and cherry sweetness. Overall I considered this to be a satisfactory pre-light draw. At this point I was ready to light up the Farmer Bill Hatchet Handle and see what the smoking experience would have in store. There were quite a bit of flavors right out of the gate with the Viaje Farmer Bill Hatchet Handle. This included notes of wood, cherry sweetness, black pepper, and cinnamon. The black pepper was also quite prominent on the retro-hale. As the farmer Bill Hatchet moved through the early stages, the cherry, wood, and cinnamon moved into the forefront and a slight cream note surfaced in the background. The cherry sweetness diminished into the background midway through the first third joining the cream and pepper notes. At times there was a slight sharpness to the pepper. Meanwhile, the wood and cinnamon remained in the forefront. In the second third, the wood notes took over as the primary flavor. This was complemented nicely by the cinnamon and cherry notes. During this stage of the smoke, the pepper notes started to get a little more prominent and the cream notes dissipated. On the final the third the wood notes were still the primary ones. The pepper notes were now very close to the forefront with the cinnamon and cherry more distant. This is the way the cigar experience of the Farmer Bill Hatchet came to a close. The resulting nub is firm to the touch and cool in temperature. Last year when Farkas was a guest on our Stogie Geeks show, he talked about how 2014 would be a year when he focused on consistency. Quietly, Viaje has had an excellent year in this area – and this has also been reflected in the construction of his cigars. The Farmer Bill Hatchet Handle is one of those well constructed cigars – and this also reflected nicely on the burn and draw. Overall I found the burn path of the Farmer Bill Hatchet to remain straight from start to finish. There was a slight curvature to the burn line, but this was never a problem-some or uneven burn. The resulting ash was a salt and pepper color. The ash was firm and came off the cigar in nice clean chunks. Flaking and flowering was not a problem with this cigar. The burn rate and burn temperature were both ideal. The draw was ideal – not too tight, nor too loose. This made for an enjoyable smoke from start to finish. While Viaje has established a reputation for many full strength, full-bodied cigars, the brand has done some nice work in the area of cigars that fall in the “medium” and “medium plus” range. The Viaje Farmer Bill Hatchet Handle is one such cigar. It is a cigar that starts out on the lower end of medium. By the second half, the strength did increase and had just enough to cross into the medium to full range of the spectrum. As for the flavors, they pretty much stayed in the medium to full-bodied range from start to finish. When it came to strength versus body, the body had the edge, but in the second half the advantage narrowed as the strength increased. In terms of the three Thanksgiving seasonal releases for 2014, the Viaje Farmer Bill Hatchet proved to be my favorite. While the woody flavors might seem a little bland to someone reading this, the complementary notes of cherry, cinnamon, and pepper really give this cigar a nice flavor profile. There is also a decent amount of complexity along the way. The one drawback with this particular cigar is that it is going to be more difficult to find because the production and distribution was more limited with this cigar. This is a cigar I would not hesitate to recommend to a novice or experienced cigar enthusiast. As for myself, this is a cigar I would smoke again – and its certainly one I’d recommend a box split of.